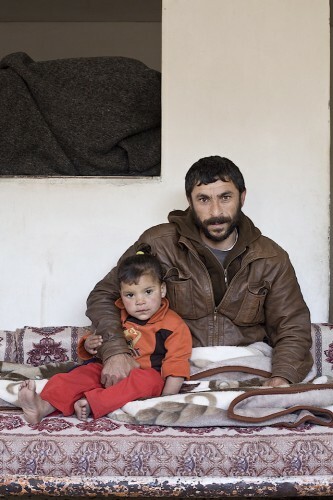 Ahmed Attar, 38, with his daughter Ansam, 3, from the Atatra area in Beit Lahia. Ahmed sold vegetables from his donkey cart. On 5th January at around 4.30 am, he left his house and helped a young girl from a destroyed neighbor’s house find safety at an uncle’s house on the same street. On his return to his house, he found two injured fighters whom he began aiding. 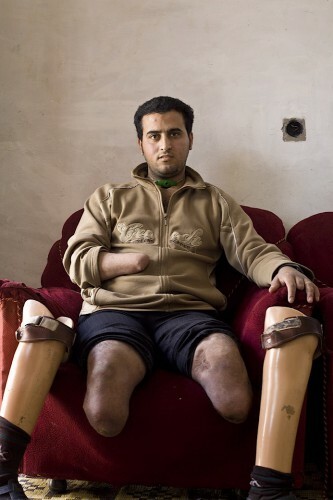 Only 70m from his house he was hit by a missile from a drone. The ambulance which tried to rescue him came under Israeli soldiers. A neighbor pulled him into his house and tried to stop the bleeding. 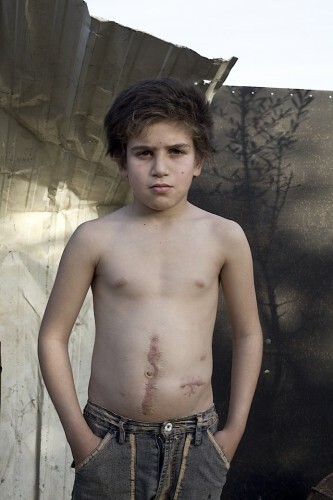 At 8 am, Ahmed’s mother used a donkey cart to transport him to the hospital. Israeli soldiers fired in front of her feet though she had placed a white flag on the donkey cart. Nonetheless she drove on. 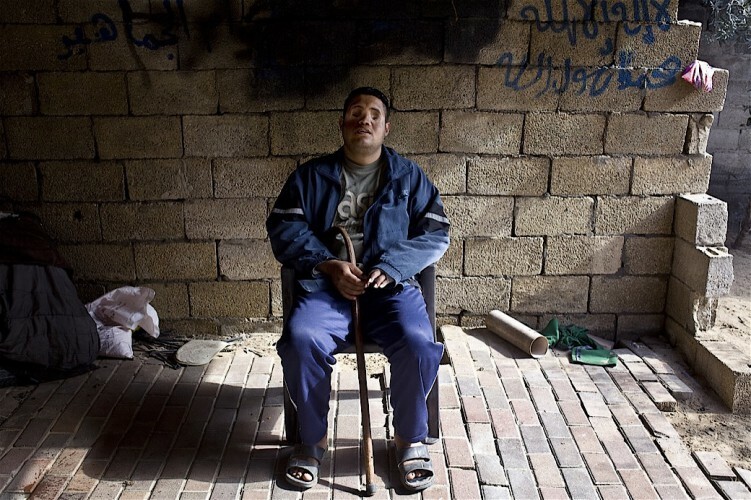 He spent nine days in Shifa Hospital before being transferred to Turkey, where he spent 6 months. Ahmed has four sons. February 2010. 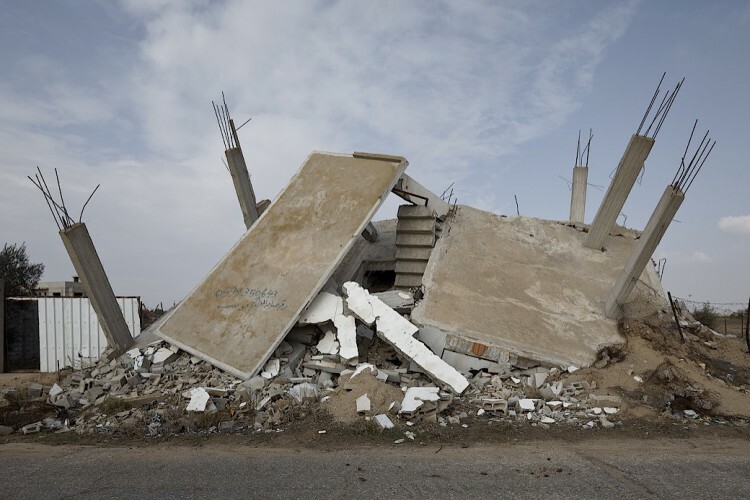 A water reservoir in the Tel al-Hauwa area in the South of Gaza City destroyed by the Israeli army during the attack on the Gaza Strip at the turn of year 2008/09. It was also used as a shelter for Israeli troops during the war. December 2009. 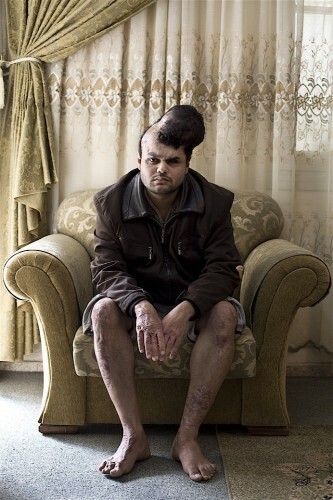 Zohair Zimmo, 49 from Rimal Neighbourhood in Gaza City. She was injured on 15, january 2009 at 9am. The area was shot at with phosphor and mostly in smoke. A 155mm shell hit through the roof into her childrens room. Her leg vanished in the explosion. 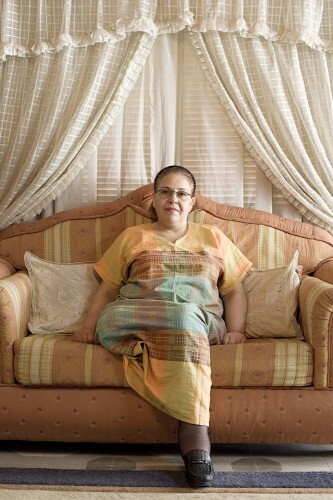 Her husband Abdel Nasr, 52 gave her first aid pulled her down the staircased and drove her to Shifa Hospital in his car. He had to remove pieces of burning phosphor from the driveway of his garage before leaving. There were also still traces of phosphor on the roof in May 2010. Ambulances were not permitted in the area at that time. Afterwards he drove back and evacuated his children as the area was under random Israeli artillery fire though there was no fighting. He also saw no Palestinian fighters. On 12, February Sohair returned to her home and received physiotherapy. The stump got infected and took three months to heal. 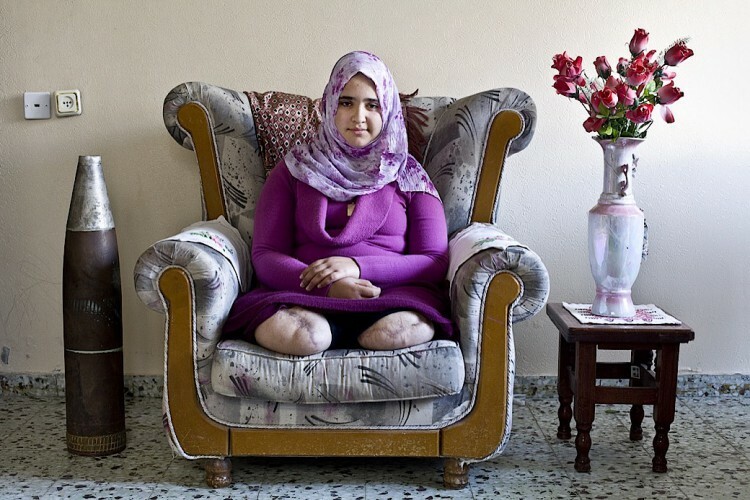 In February 2010 she received a prothesis in Bethlehem but it is not sufficient (unstabel & heavy). She was to go abroad to get a new one. Her husband is an electrical ingeeneer but unemployed. May 2010. 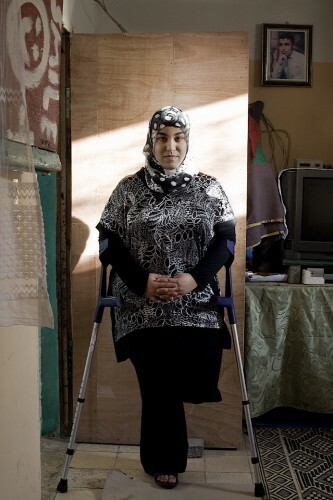 Heba Rajab, 24 from Beit Lahia was injured on 3, November 2006. She was taking part in a women demonstration in Beit Lahia. The demonstartion aimed at freeing about 70 Palestinain fighters who were surrounded in the Um al-Nasr Mosque by the Israeli army. When the demonstration reached the mosque a tank fired at the demonstartors. Heba received four bullets in hip, one in leg and one in the hand. Two women were killed. She was transported to Shifa Hospital and after four days she was transfered to Egypt. There she stayed 40days with her mother Najah in a hospital. She had more than 20 operations due to the fractures that resulted from the bullets. After being back in Gaza she received a metall cast which got infected and was treated by Doctors Without Borders. After she went to again to Egypt to get the nerves of her hand operated which worked out. She stayed for two months and had a plastic surgery in Palestine Hospital which got infected as well. Than she was transfered to Istambul were she received a plastical surgery for her hip which failed. She is in urgent need for another mayor operation but can´t pay for it. She studies civil engeenering has four sister and five brothers. She was married but her husband abandoned her after she was injured. May 2010. 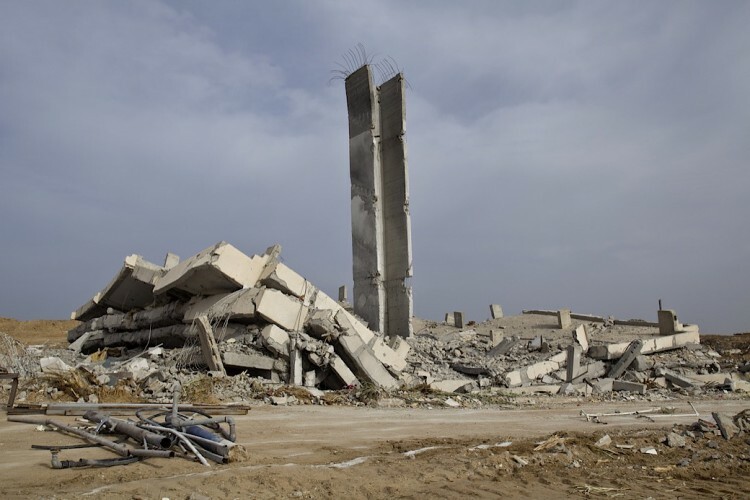 A concrete factory in the quater Izzbet Abed Rabbou in the East of Gaza after the Israeli attack on the Gaza Strip at the turn of year 2008/09. During the assault a lot of the civilian infrastructure was hit like schools, waterwells, hospitals, factories. December 2009. 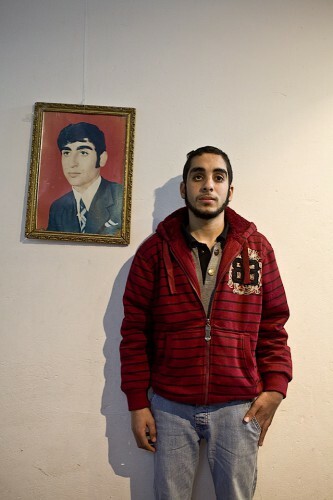 Mohammed al-Haddad; 25 is a student in accounting at the Jerusalem Open University from Tel al-Hauwa / Gaza City. On 15; January about 11.30am the Volkswagen Golf he was sitting in with his family was shot with two rockets. One of it contained phosphor. His father a bankdirector Adi al-Haddad; 55; his mother Ichsan; 45; his brother Hatim; 24 and his sister; 14 were incinerated. The explosion blow him out off the car and left him with heavy burns on legs; hands; chest and head. He also lost an eye; broke his jaw and his spleen had to be extradited. Since yet he had seven operations some were executed by Doktors Without Borders. The last was a transplant of skin from the leg to the skull. Than a little ballon with a special liquid was implantated under his skull. Every Monday and Thursday more liquid is press into the ballon and the skin with the air grows once it is big enough the transplanted skin will be removed and the ballon as well. The newly grown skin with the hair will be put in its place. So the burns on his head will have vanished. The procedure doesn´t cause him any pain. He still needs a lot of plastical surgery on the legs and hands. Three fingers of his hand grow to gether because of the burns and were separated again. The tensions on the skin cause him pain. February 2010. For more than 20 years Kai Wiedenhöfer has been taking photographs in the Middle East, a place where many journalists and photographers have covered the Israeli-Palestinian conflict. 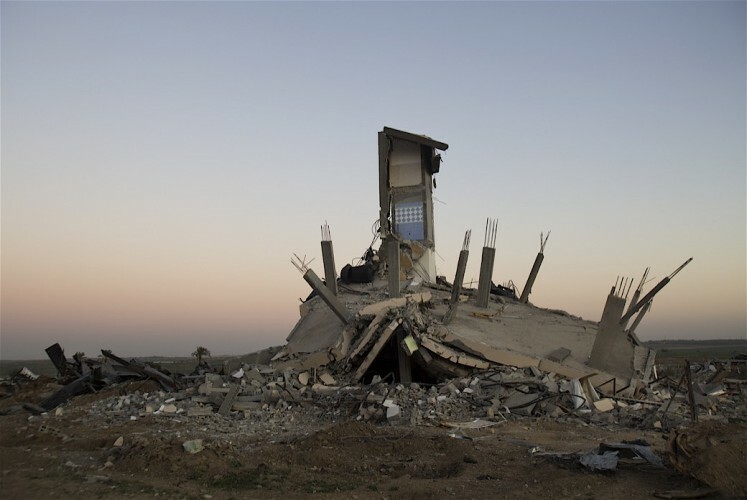 Yet Wiedenhöfer is unique in that he concentrates exclusively on Gaza, and often remains there for extended time to take photos long after the media has moved onto more ‘pressing’ news stories. 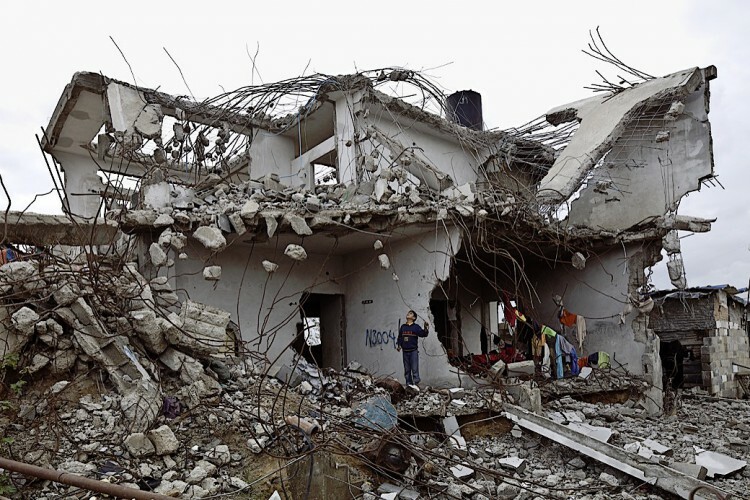 Even in 2009 after the offensive of the Israeli army, Wiedenhöfer was in Gaza. During this time he took disturbingly quiet, almost repetitive pictures of the bleak aftermath of the war that form The Book of Destruction. 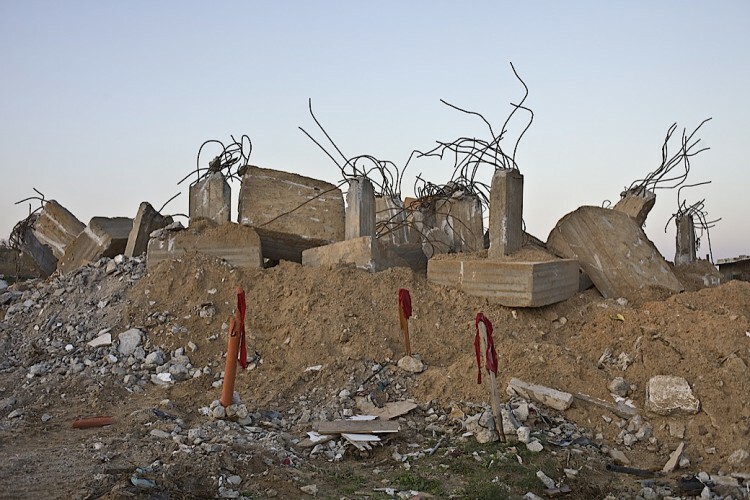 Wiedenhöfer´s images of crumbling ruins and maimed civilians are a powerful landscape of disquiet and destruction.